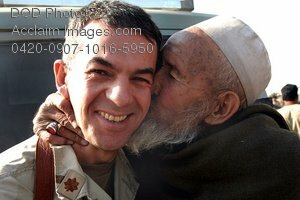 Description: Free, public domain image: Afghan Man Kisses a U.S. Navy Doctor in Appreciation for Relief Food. KABUL, Afghanistan--U.S. Navy Lt. Cmdr. Yevsey Goldberg, a doctor deployed to International Security Assistance Force (ISAF) Headquarters, is thanked by a resident of a refugee camp where Goldberg helped bring more than 550-kilograms of rice and other supplies on Dec. 6, 2008. The rice was purchased using money that was donated by Goldberg and other members of the Volunteer Community Relations and Resources group that is made up of military and civilian personnel deployed to ISAF Headquarters. ISAF photo by U.S. Navy Petty Officer 2nd Class Aramis X. Ramirez.